Double sprung bolt through tubular mortice door latches, suitable for use with unsprung door knobs or sprung door handles and door levers. Available in 2 ½, 3, 4, 5 & 6 inch sizes, in brass, polished chrome, satin chrome, black or antique brass/bronze plate finish. 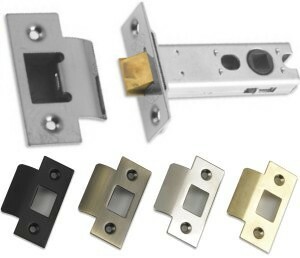 2 ½ inch latch has 45mm backset from door to centre spindle. 3 inch latch has 57mm backset from door to centre spindle. 4 inch latch has 82mm backset from door to centre spindle. 5 inch latch has 108mm backset from door to centre spindle. 6 inch latch has 132mm backset from door to centre spindle.